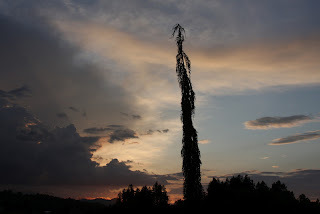 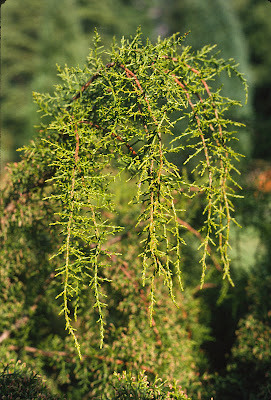 Everyday I enter the office and see my photo on the wall of Picea omorika 'Pendula Bruns'. 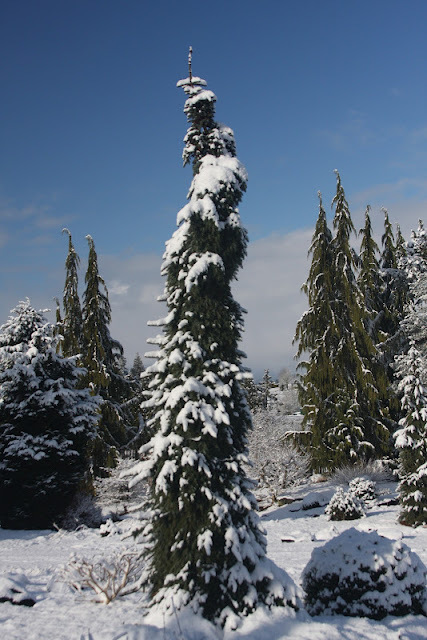 For me it is a scene from the Austrian Alps: a fantasy of nature in the winter. 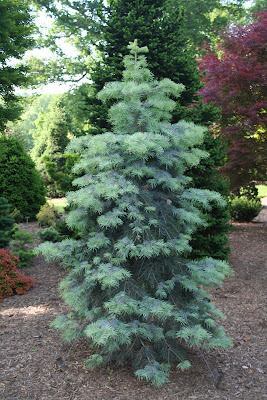 The tree looks great in summer too, of course, and proudly resides in our Blue Forest. 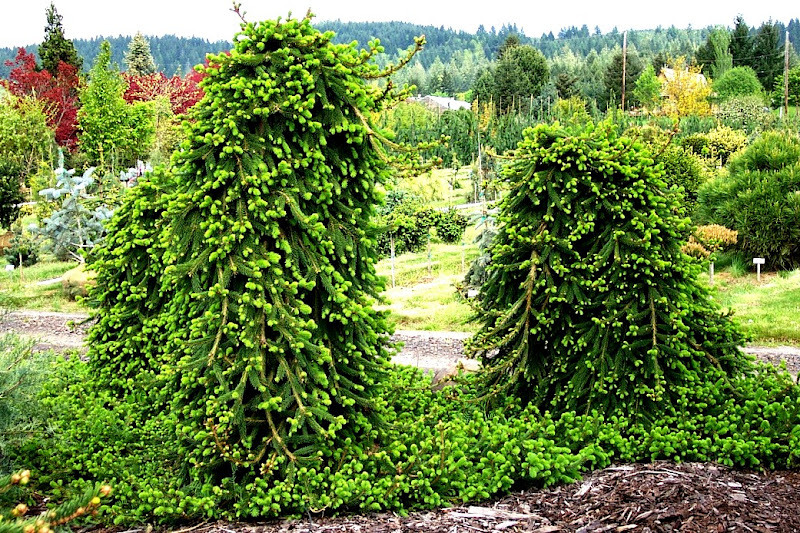 A former employee brought her husband, a native Oregonian who loves nature, to the nursery so she could show him all of the "cool" plants. After a two hour visit he concluded that there wasn't even one "normal" tree. 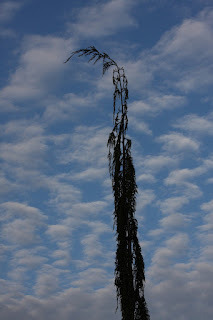 Everything was weird in some way: like weeping, or dwarf, or blue if normal was green etc. 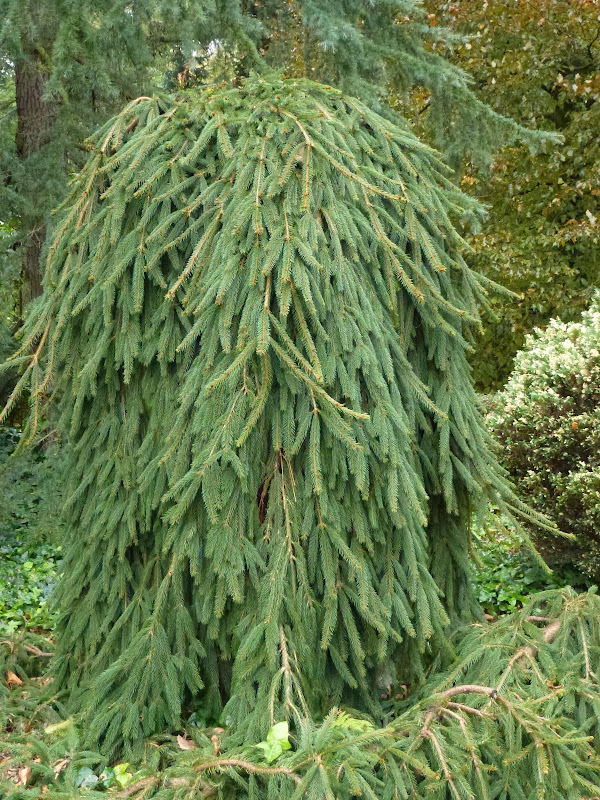 He wasn't at all impressed. A good deal of horticulture is weird, then. 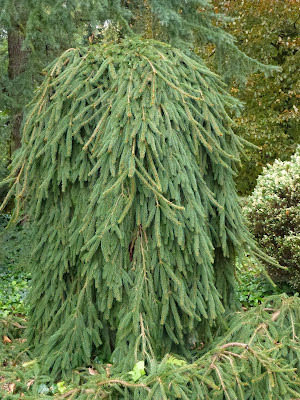 But fortunately I have found enough customers to support my collection. 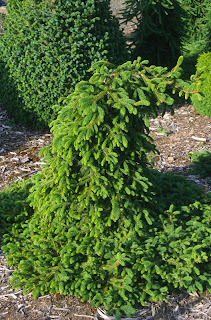 Weeping conifers, such as Picea omorika 'Pendula Bruns', are a large part of what I grow. Until now, thirty two years after I began the nursery, I've never even asked myself why I like them. 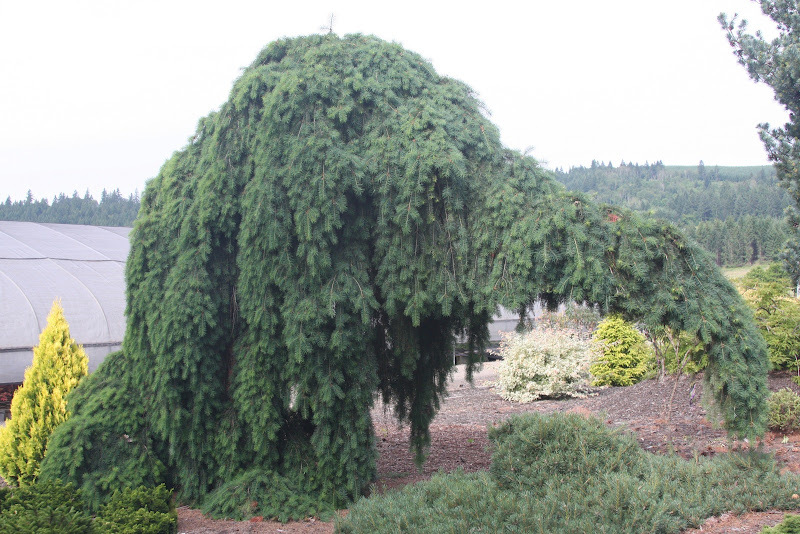 Because they're graceful, I guess. 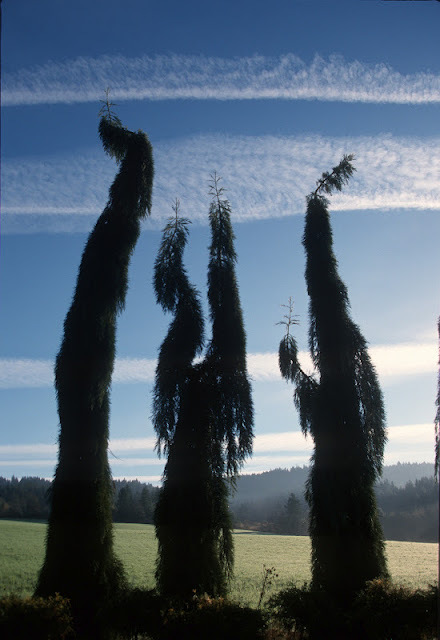 Also because they're different; they're weird. 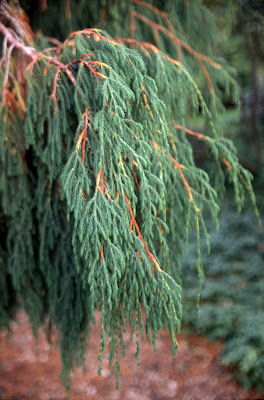 I suppose every genus of conifer has its weeping cultivars. 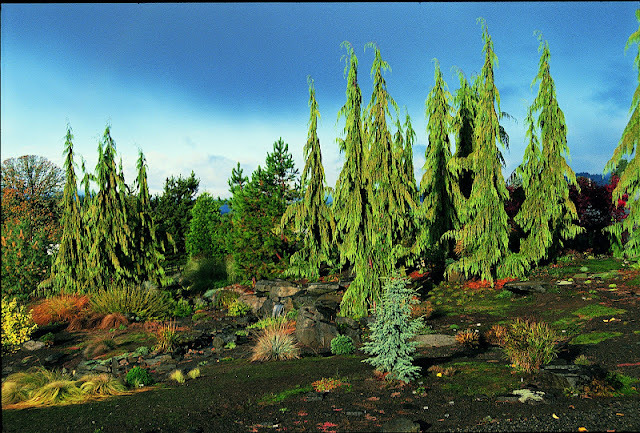 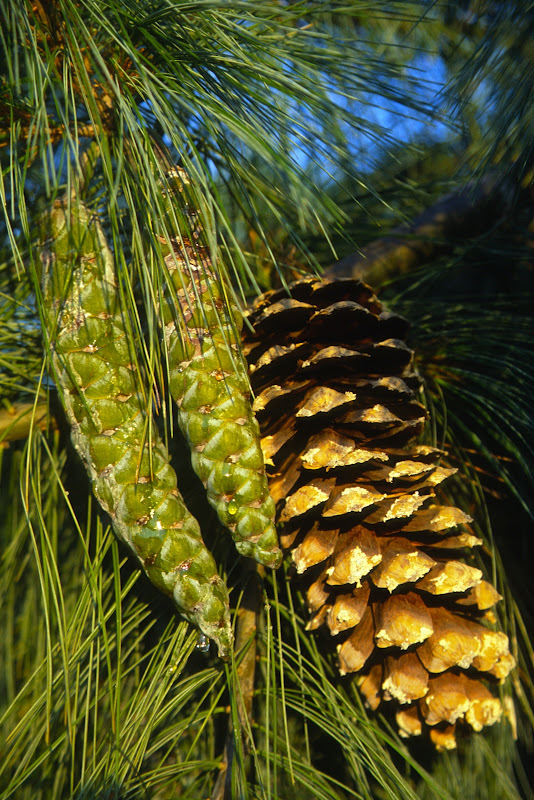 Also, some species have evolved with pendulous habits, such as Picea breweriana from Oregon and Juniperus cedrus from the Canary Islands. 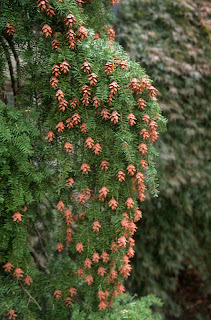 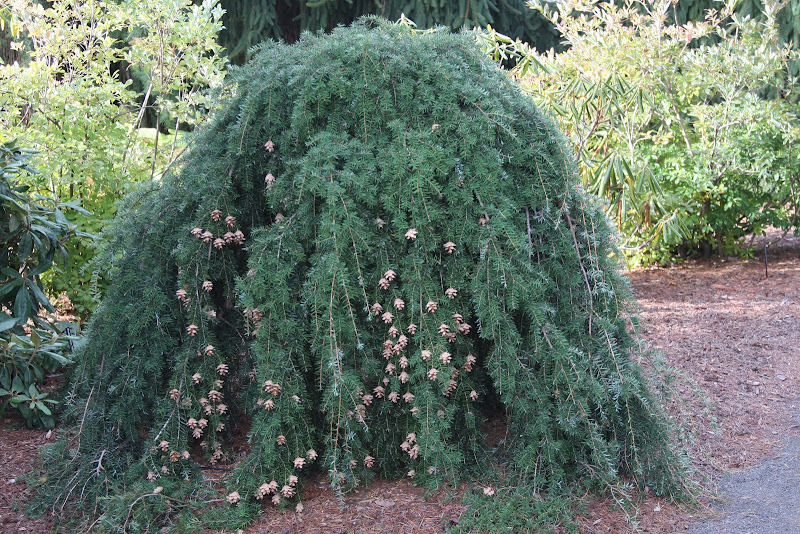 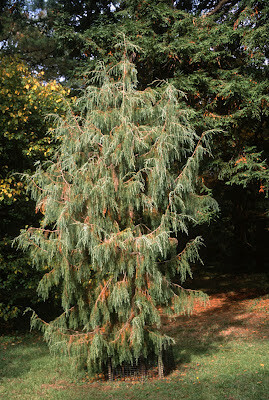 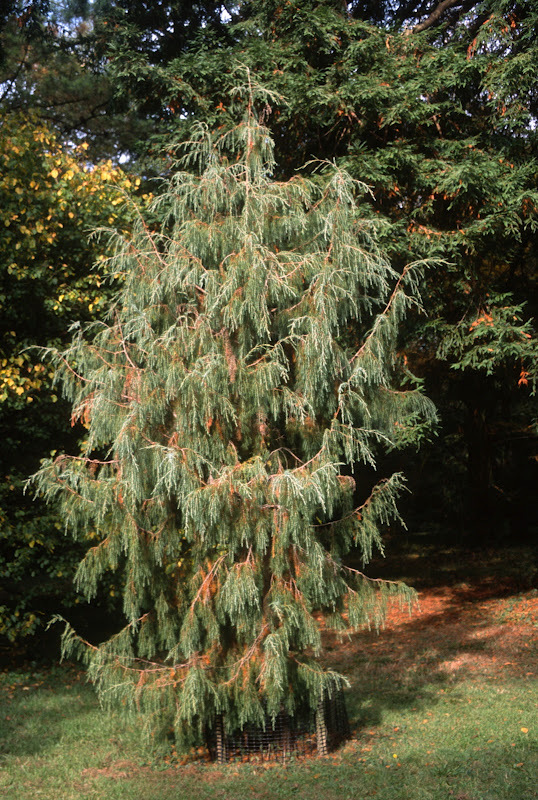 Cedrus deodara, the species itself, displays a soft droopy look, especially when young. 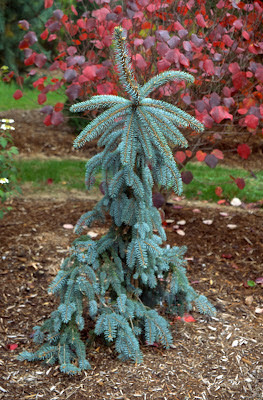 'Feelin Blue', a prostrate cultivar, is transformed into a small, strict weeping tree when staked. 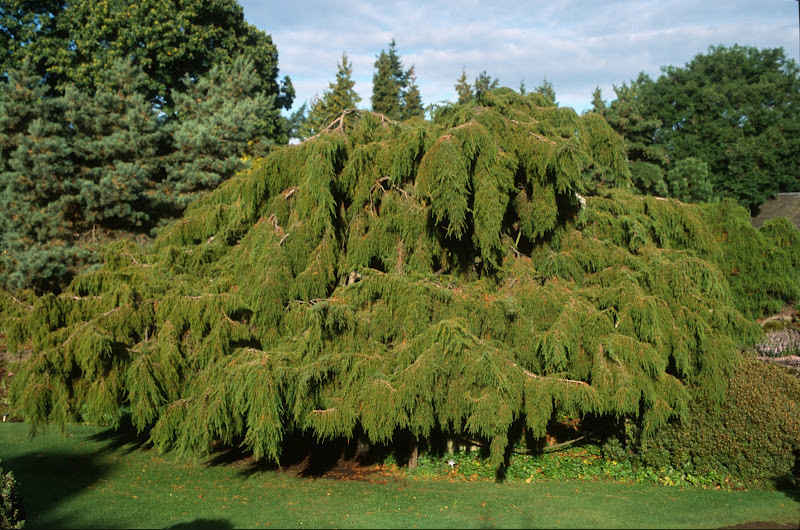 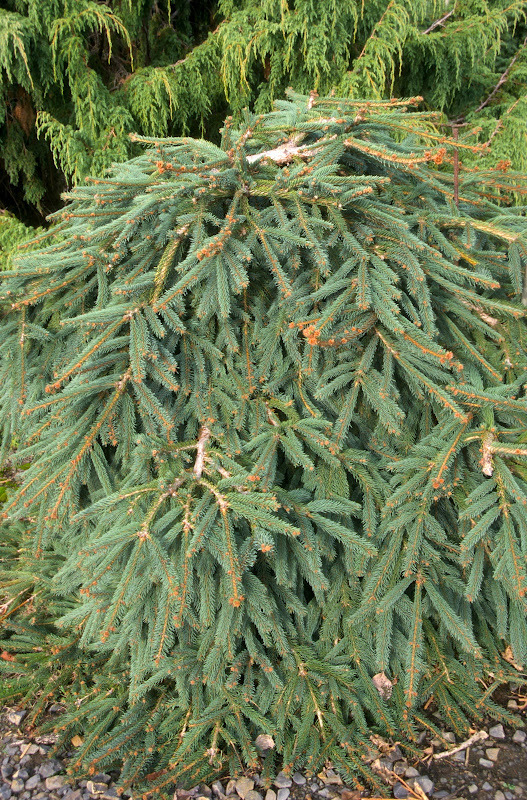 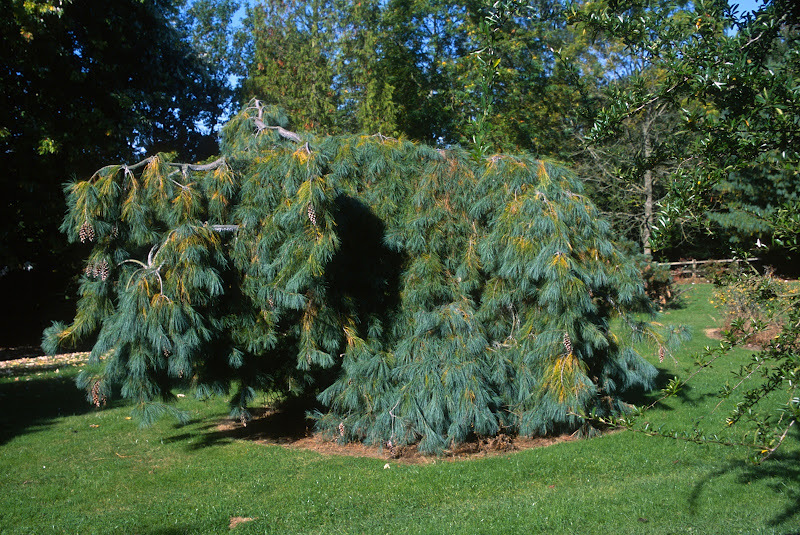 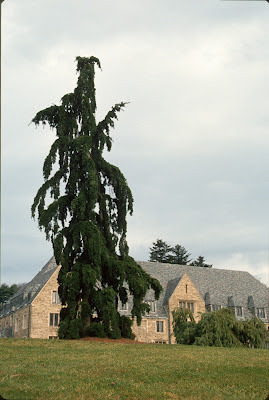 The same with Cedrus libani 'Beacon Hill', a "Cedar of Lebanon" discovered in Canada. 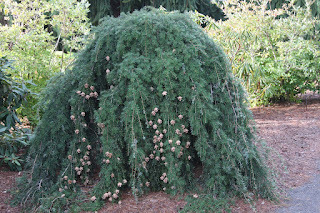 Consider the "hemlocks:" Tsuga canadensis 'Pendula', or the "Sargent's weeping hemlock," is popular in landscapes, but ultimately will form a huge spreading mound. 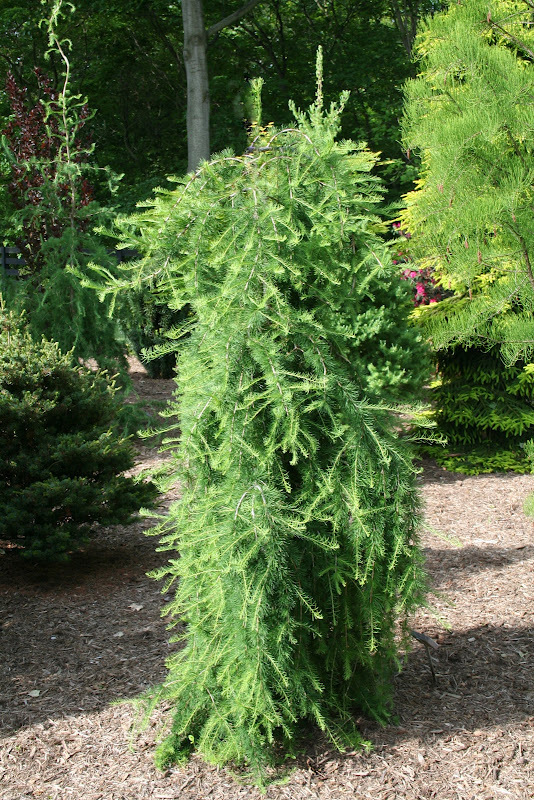 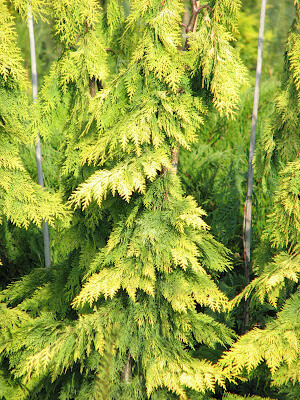 More interesting for the average garden, I think, is Tsuga carolina 'Labar's Weeping', or its sister seedling Tsuga carolina 'Mountain Mist'. 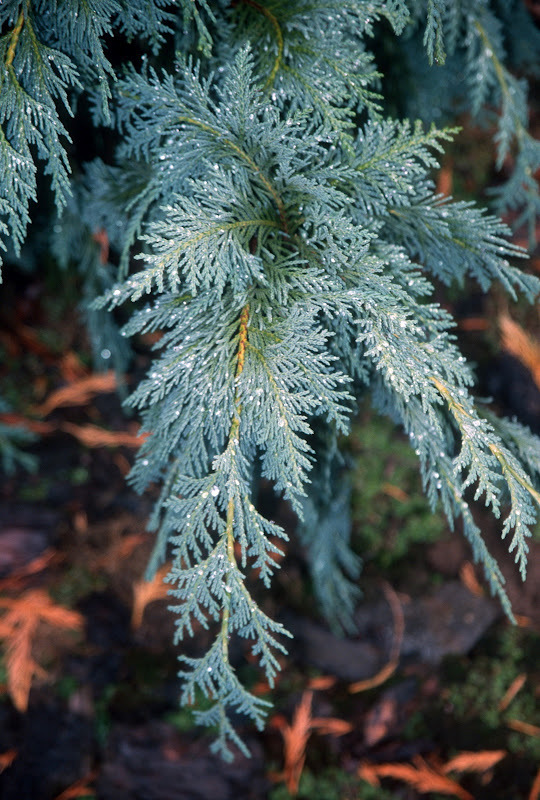 Even better is our native west-cost hemlock, Tsuga heterophylla 'Thorsen', a fantastic plant either left creeping low on the ground, or staked into a narrow little tree. 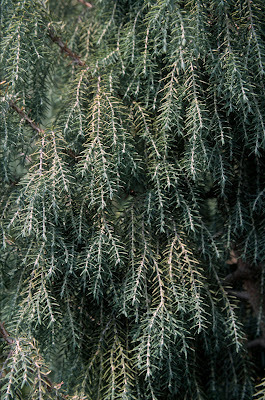 Foliage is much more refined than with the other species. 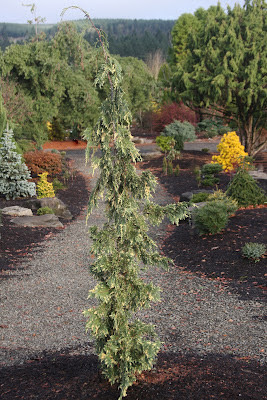 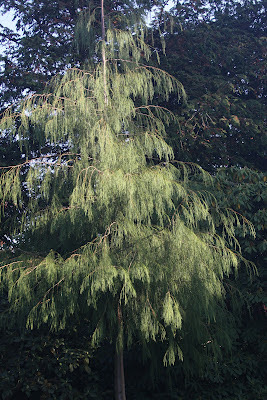 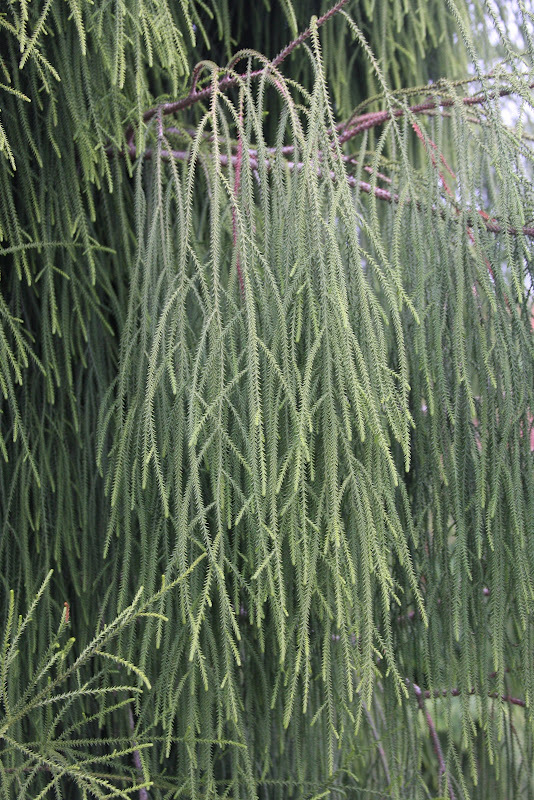 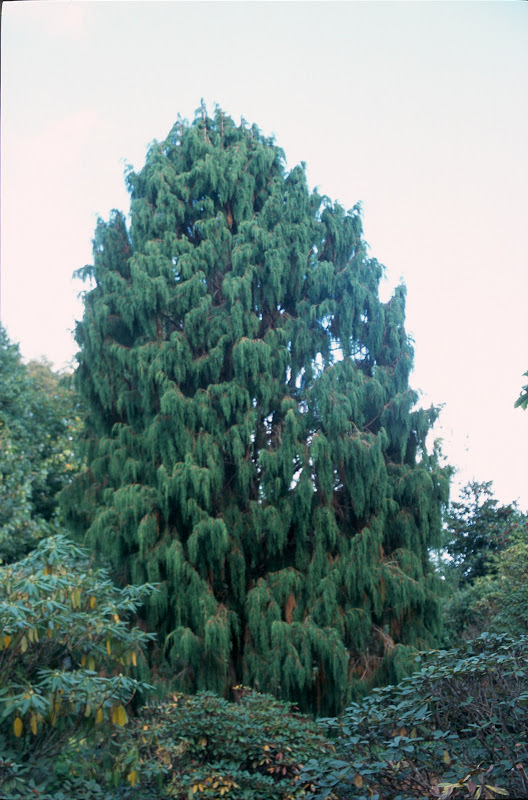 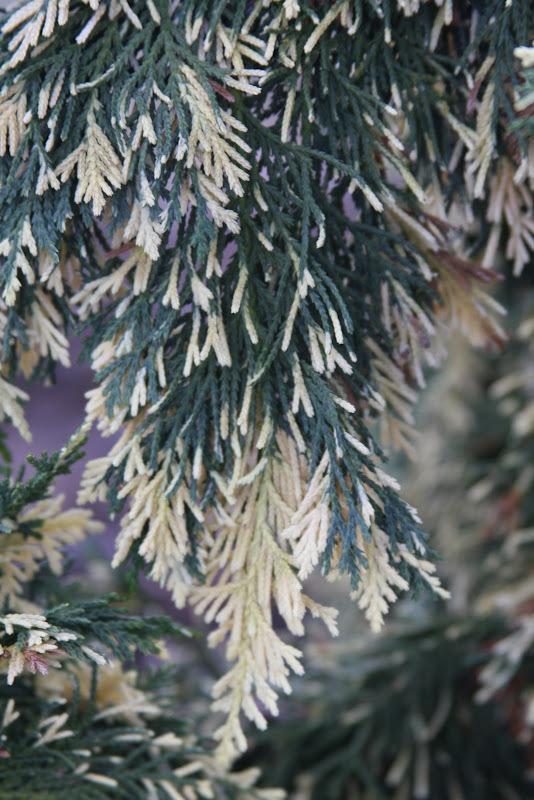 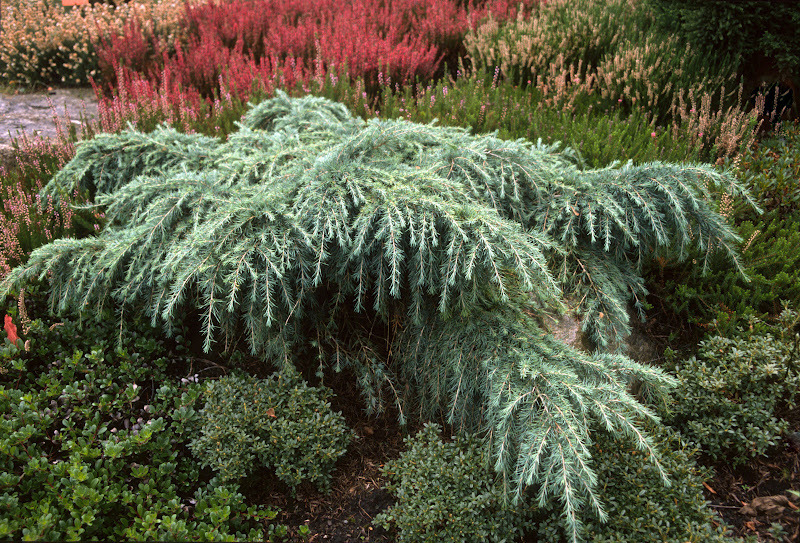 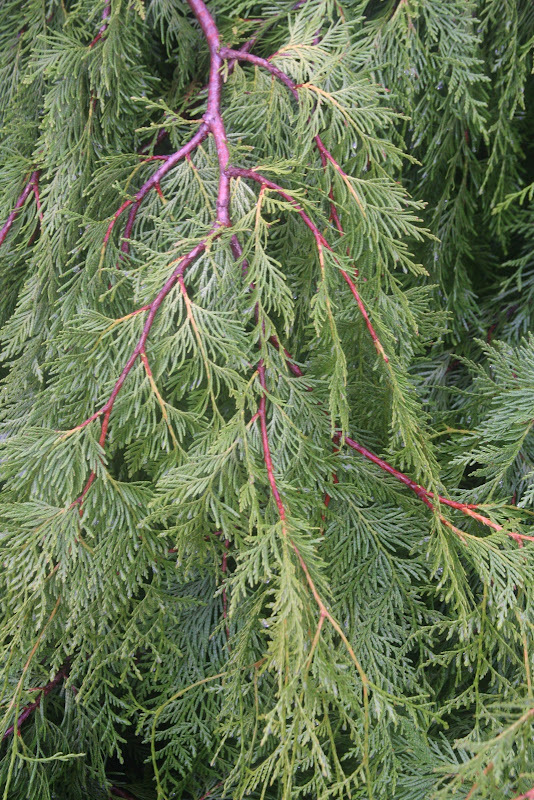 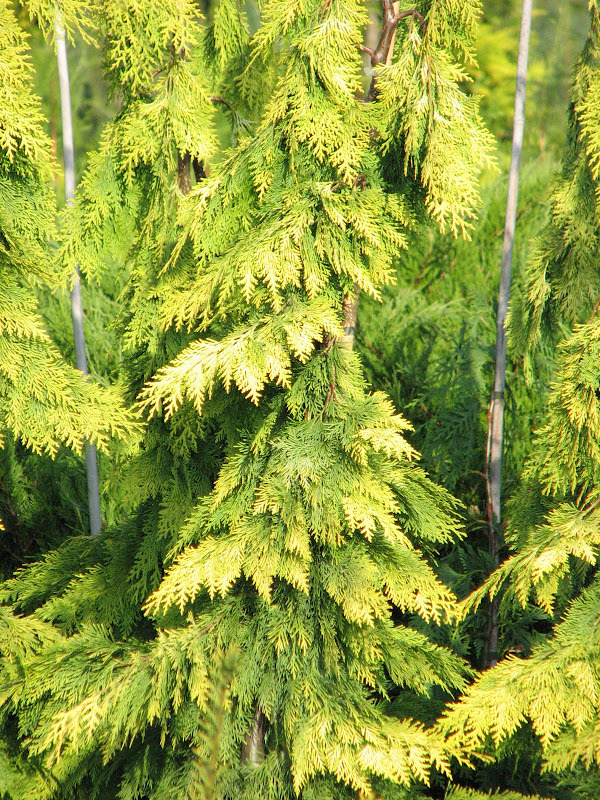 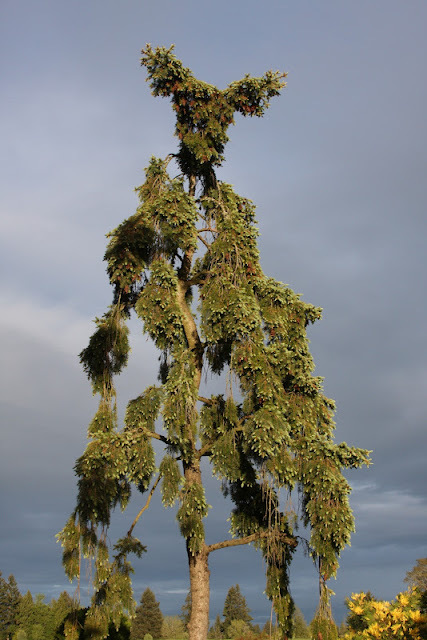 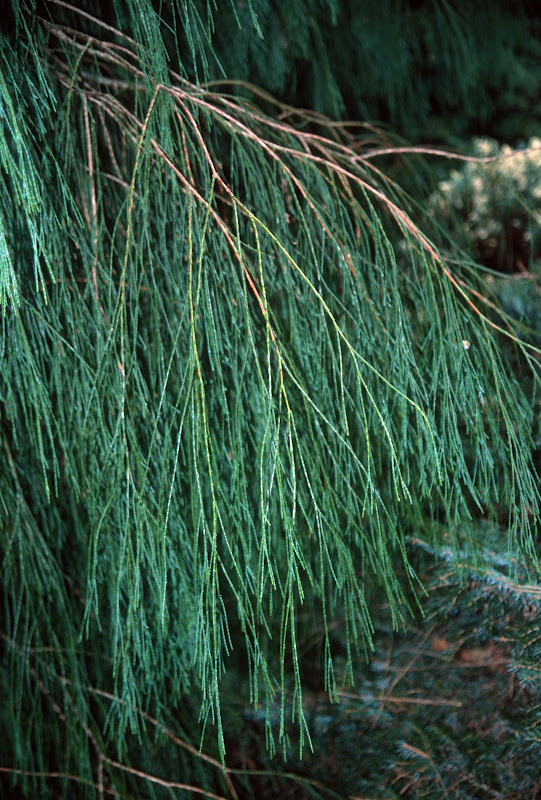 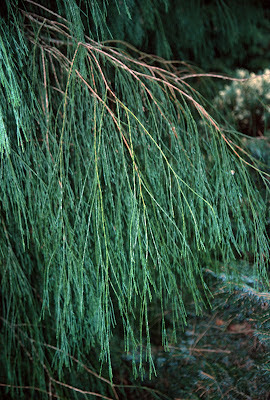 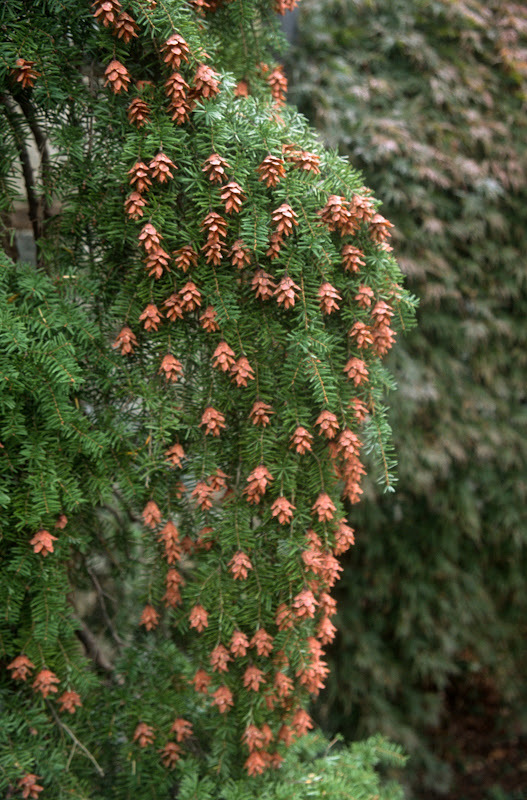 Besides the 'Pendula Bruns', there are many weeping selections of spruces. 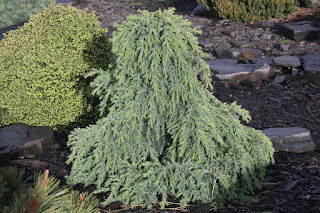 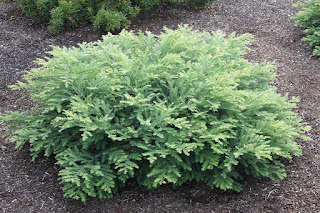 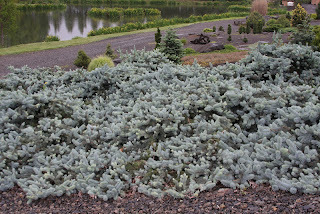 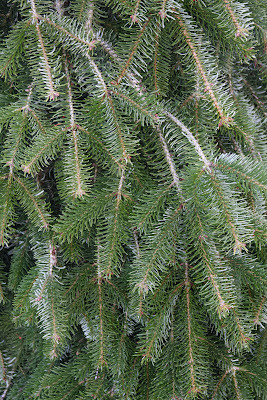 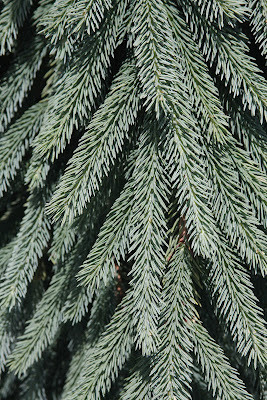 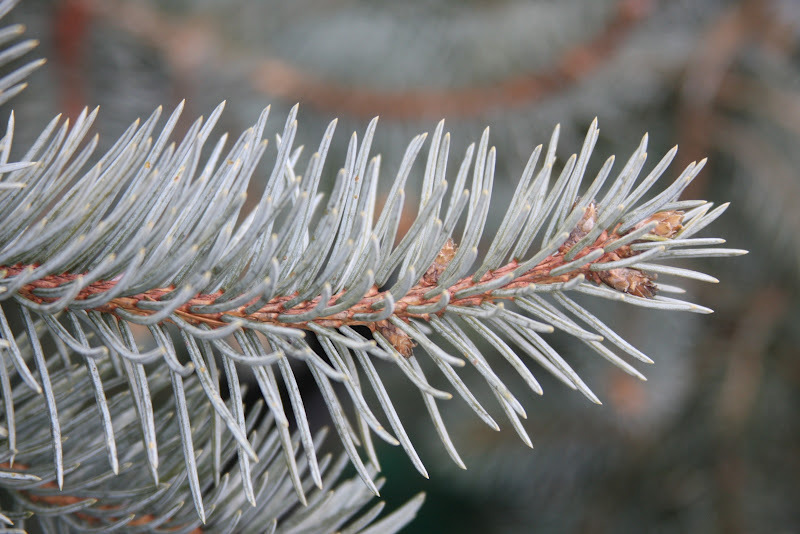 Picea engelmannii 'Bush's Lace' is a vigorous grower with powder-blue needles. 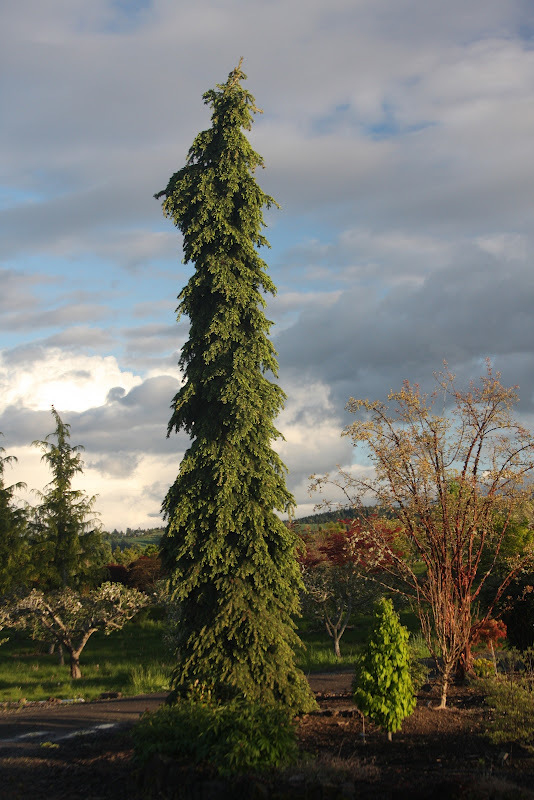 When young, it shoots upward at a fast pace, then at maturity it may be as broad as tall, with no two heaps really looking alike. 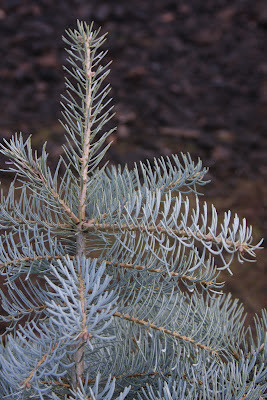 But, so blue. 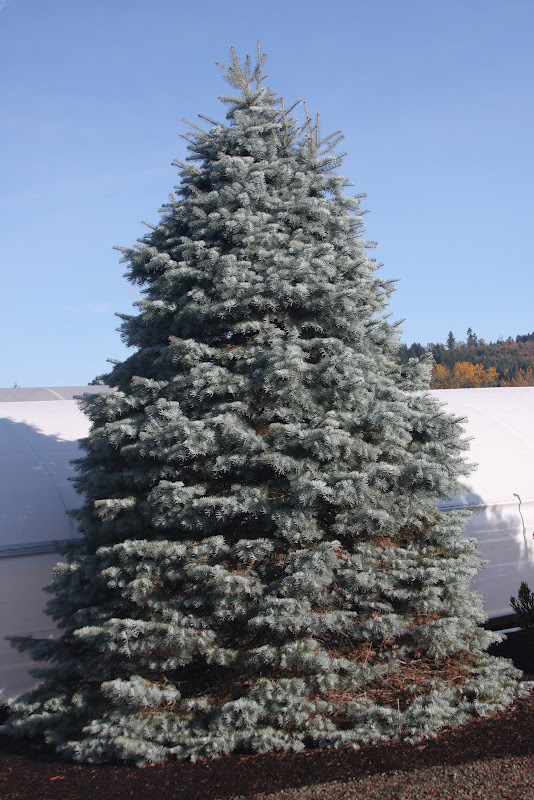 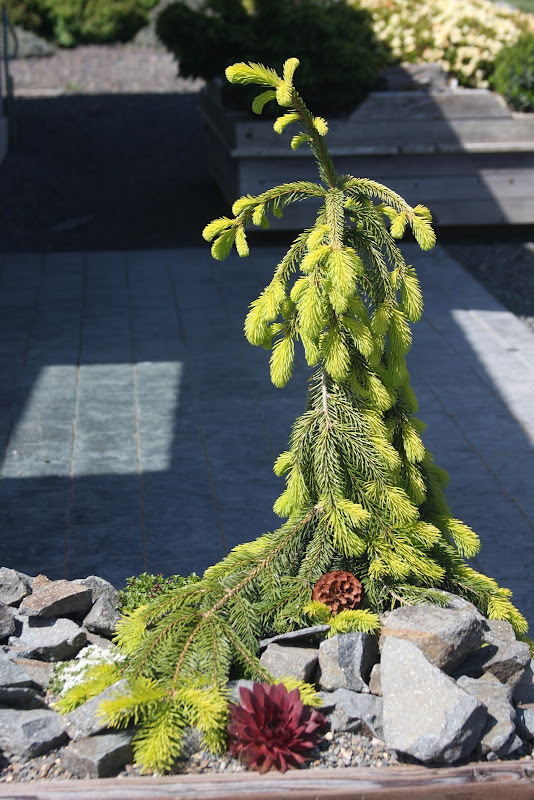 Picea glauca 'Pendula' is more formal, with a narrow "alpine" appearance. 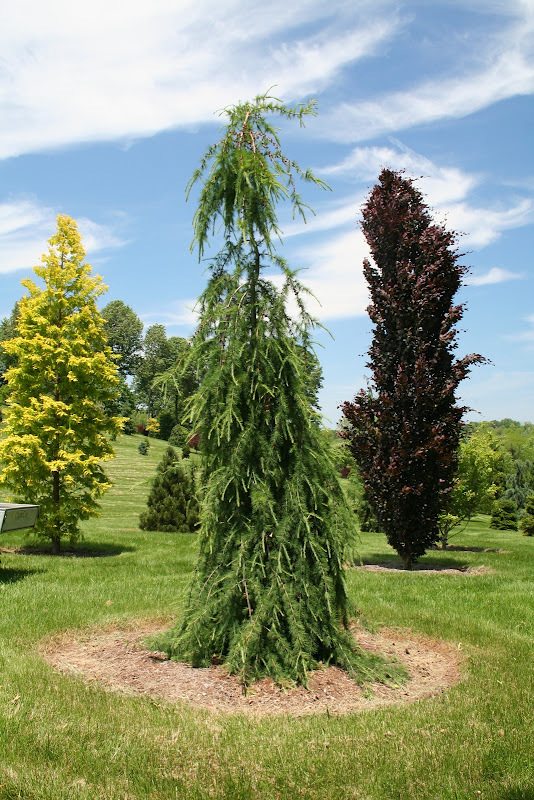 It has become fairly common in recent years, and for good reason, as it makes a vertical presence in the landscape without taking up much room. Another Picea glauca with a strong weeping habit is 'Ketch Harbor', found by Greg Williams on a trip to Nova Scotia. It is a tidy little tree and never gets too big. 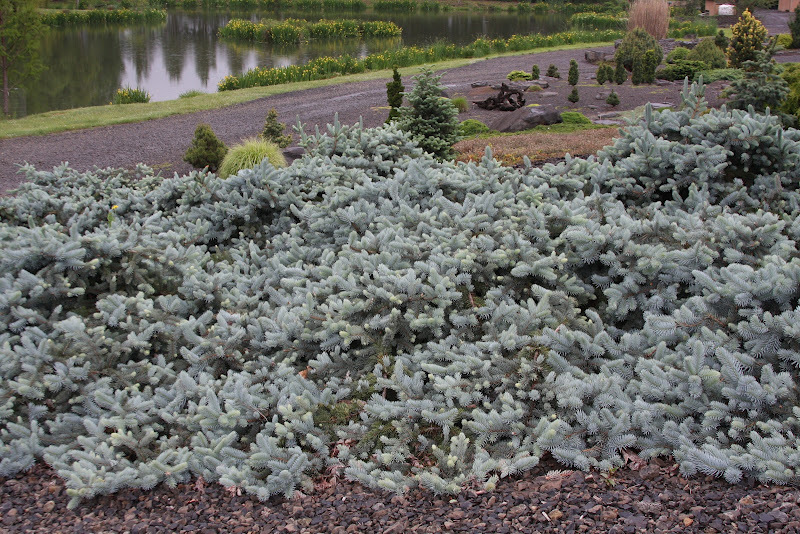 The Scotians probably would prefer that we spelled their harbour correctly. 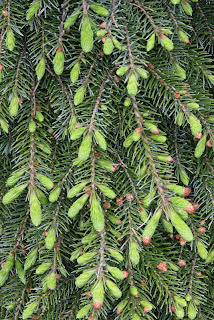 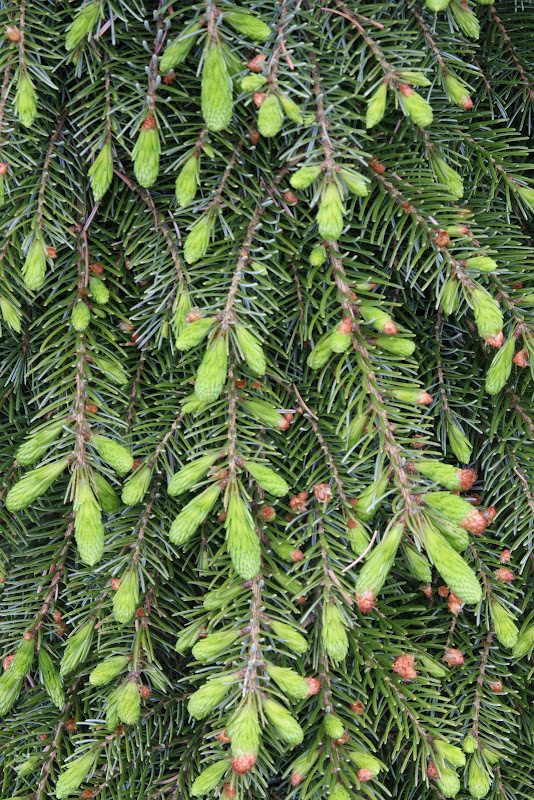 Picea abies 'Farnsburg', 'Frohburg' and 'Wartburg' are German selections, and don't differ by much. 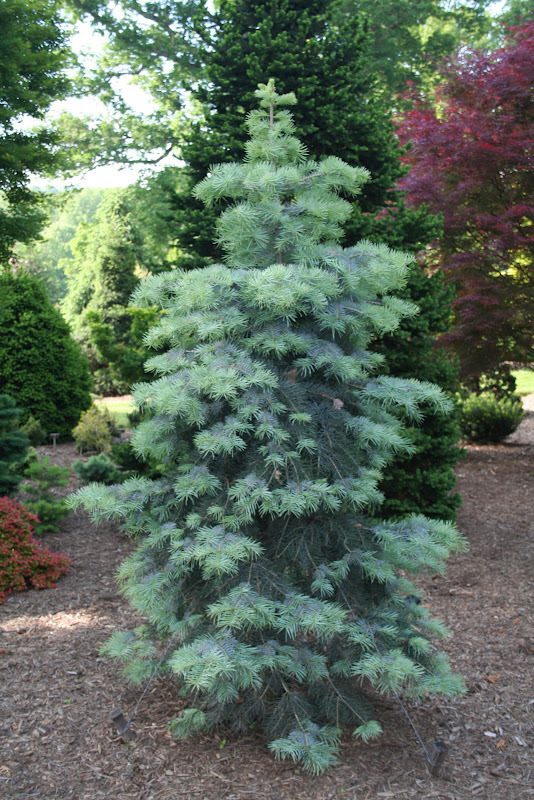 Perhaps 'Farnsburg' is the most dwarf of the three, with shorter green needles and a neat appearance. 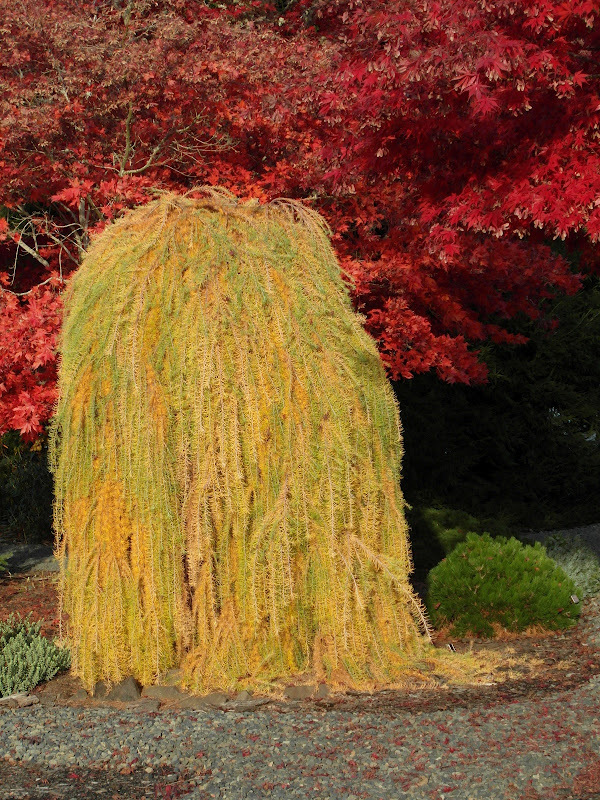 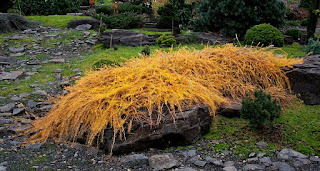 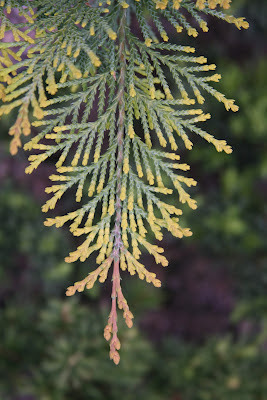 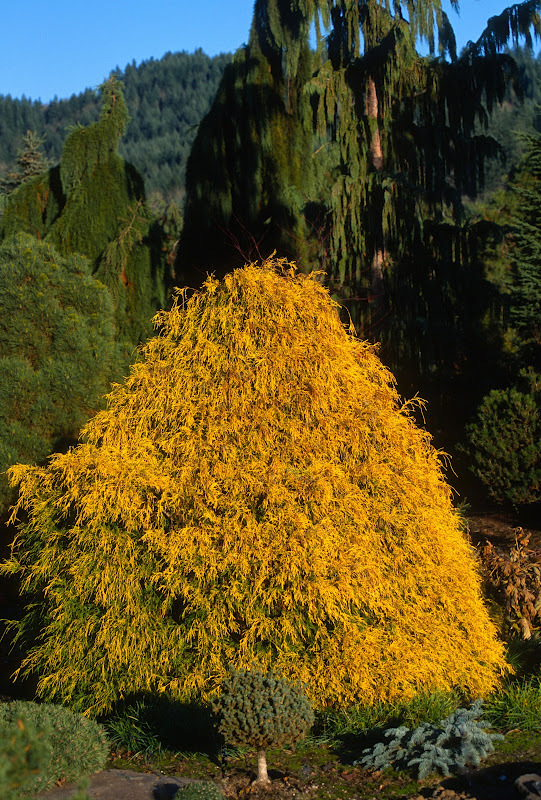 'Glauca Pendula' is a bluish form of "Weeping Norway," and 'Gold Drift' displays yellow foliage, so yellow that it surpasses the sickly yellow of other unhappy conifers. 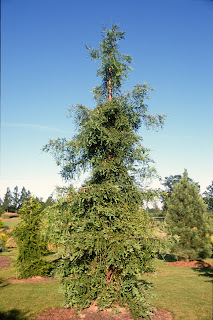 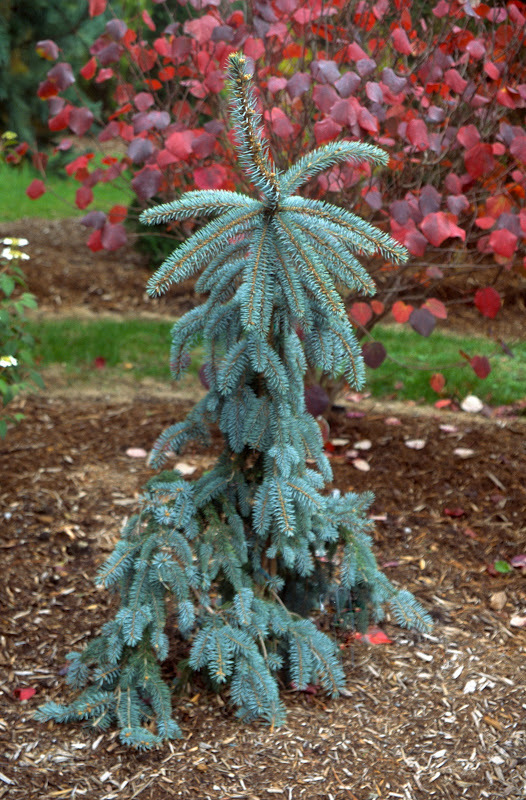 There are a number of pendulous Picea pungens cultivars. 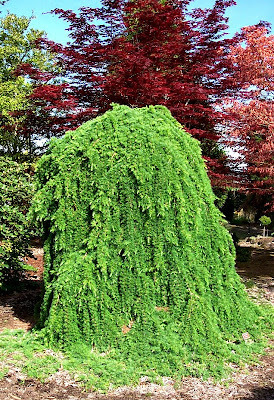 The ground-creeper, 'Procumbens', can be staked to make a small weeping tree. 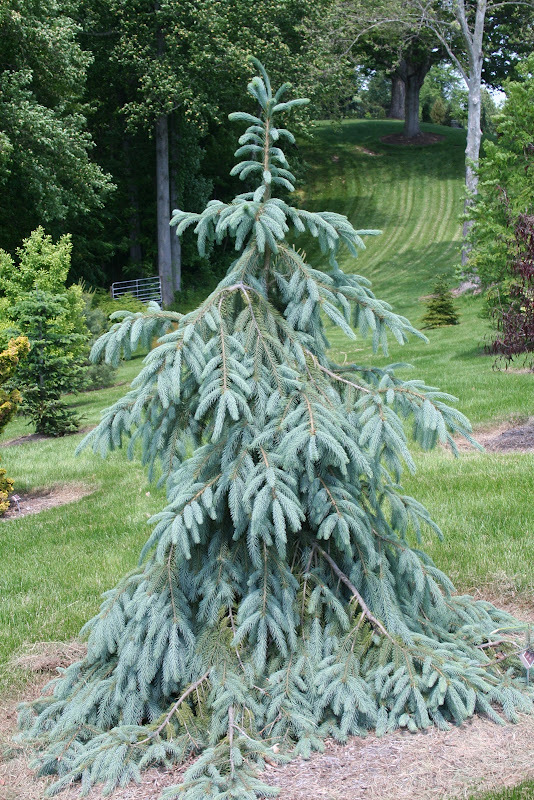 The more rambunctious spreader, 'Prostrata', cannot be staked to make a drooping tree, as it will revert to a normal upright blue spruce. 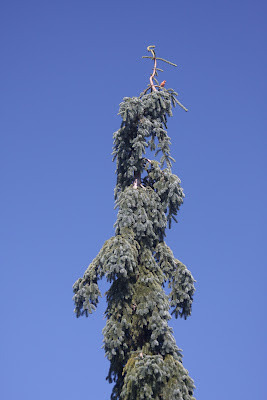 I know from experience. My favorite weeping pungens is 'The Blues', an excellent selection from Larry Stanley of Oregon. 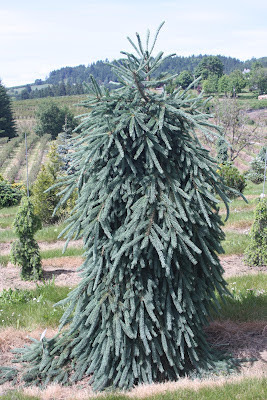 There exist other "cultivars" that look exactly like 'The Blues', and some suspect that they could be rip-offs for patenting and marketing purposes. Shame on those sellers if that is true, and may they perish in their fields, both the growers and the trees. 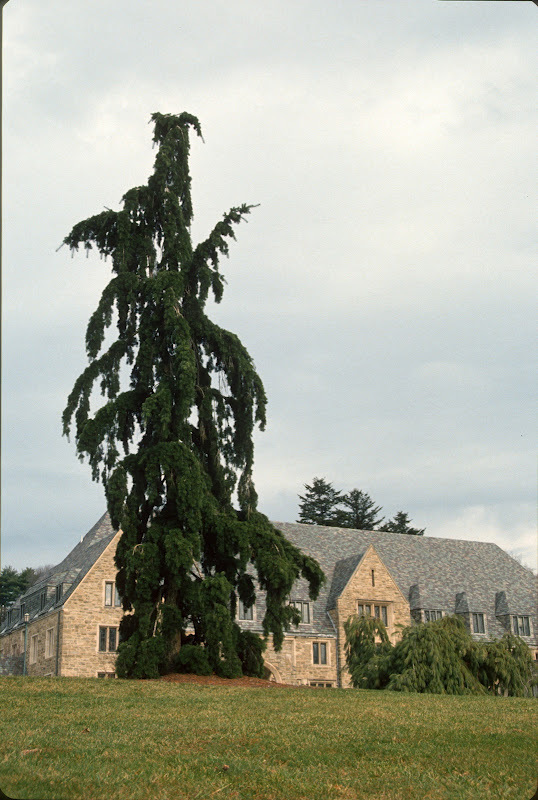 Chamaecyparis nootkatensis can grow gracefully narrow at high elevations, but tends to be a huge crappy-looking tree in lower locations. 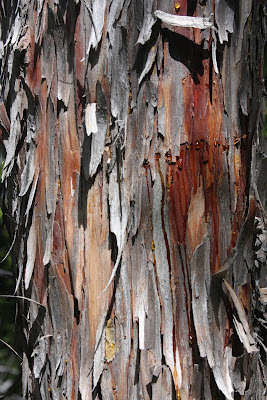 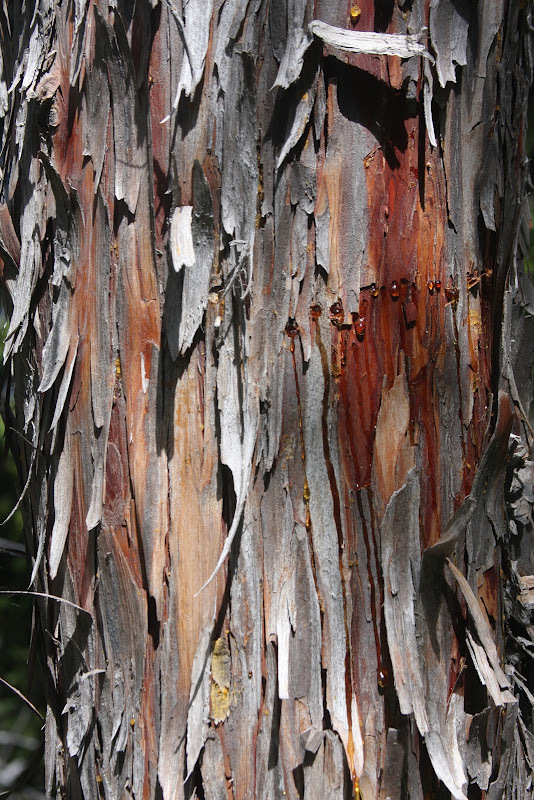 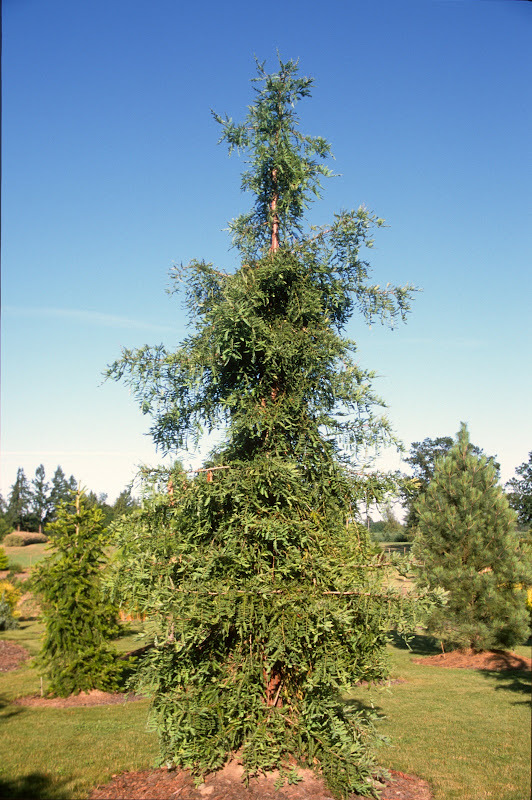 The cultivar 'Pendula' solves that problem, and when produced by rooting or grafting, all trees look pretty similar. I prefer two more narrow selections however--'Green Arrow' and 'Van den Akker'--as they are exceedingly narrow. 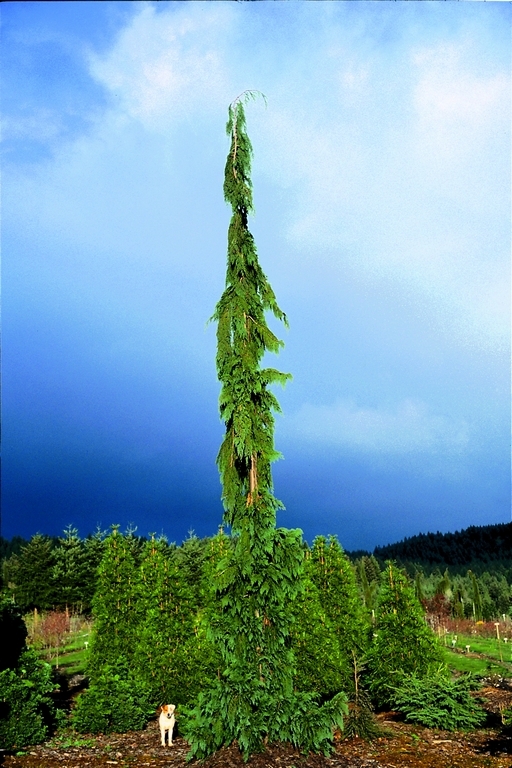 'Green Arrow' was found on government land on Vancouver Island, Canada, by Gordon Bentham. 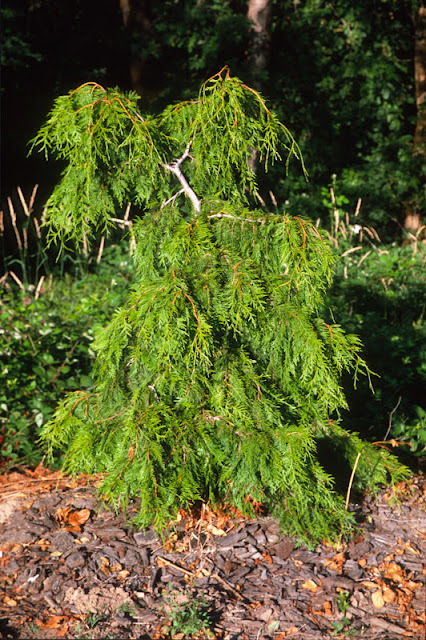 He died shortly thereafter, but I was fortunate to introduce the first grafts into the United States. 'Van den Akker' was discovered by someone of no importance, but its potential was realized by the landscaper from Washington state, namely, the late Mr. Van den Akker. 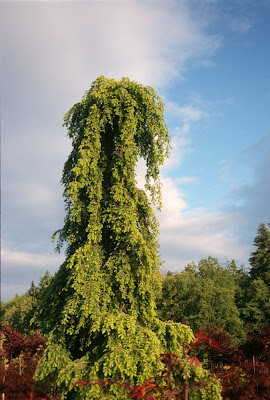 I wonder what would have happened to 'Green Arrow' if Bentham hadn't told me about this fantastic tree, and I didn't rescue it by chance after he died, as the starts were languishing in a bankrupt nursery in Victoria, B.C. 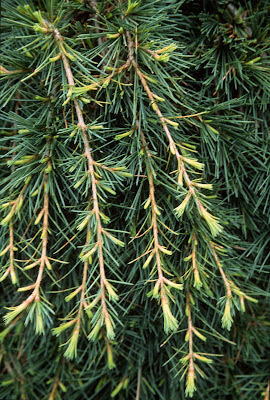 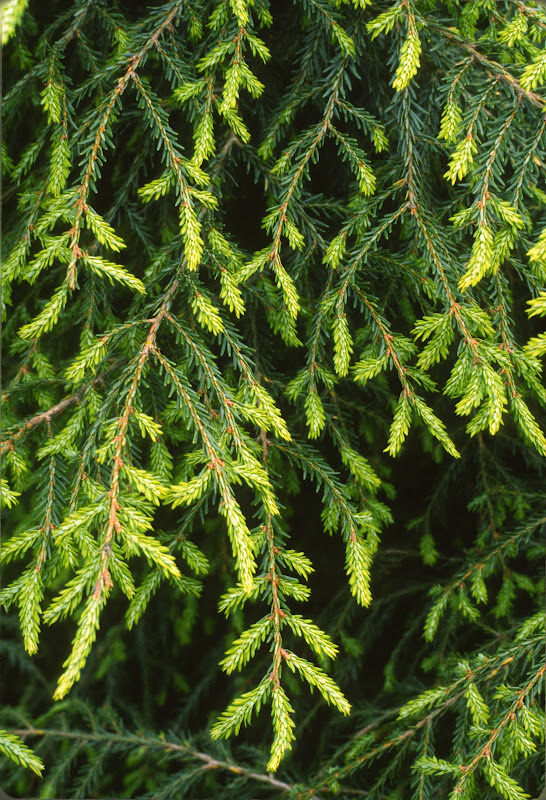 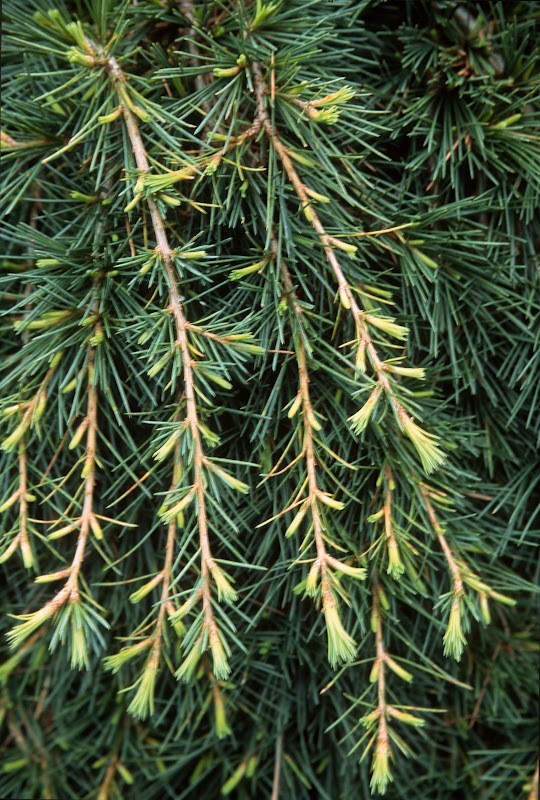 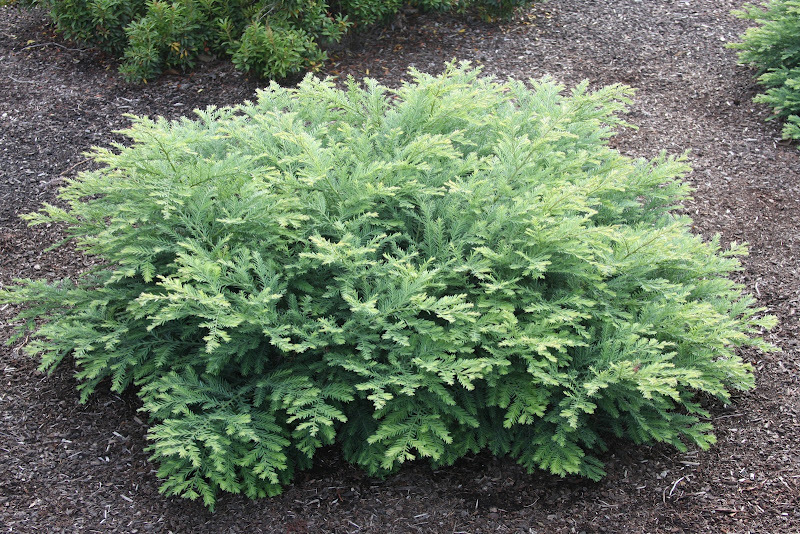 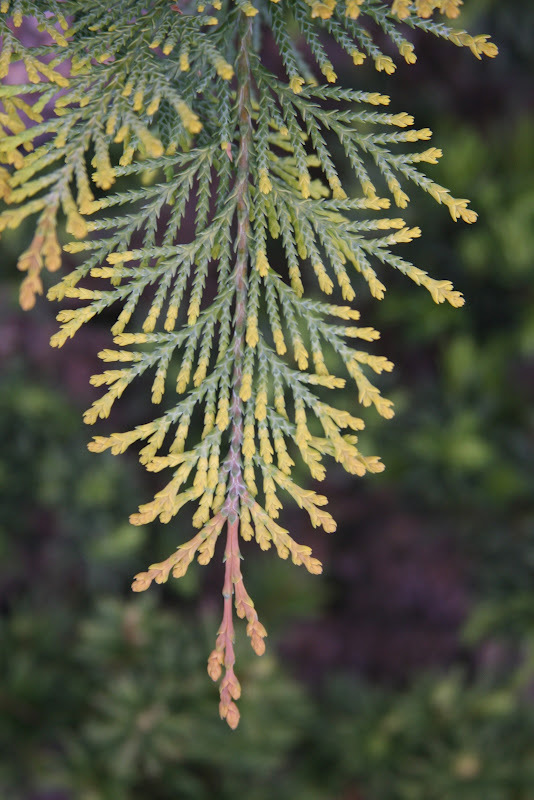 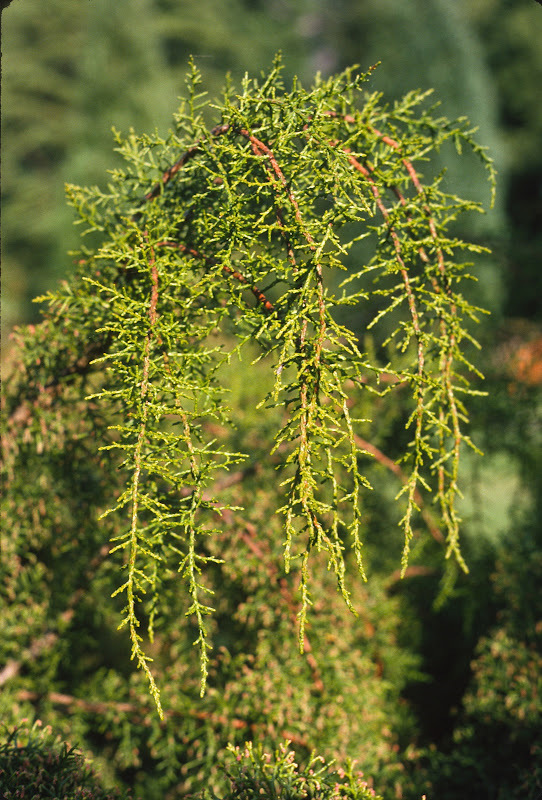 Chamaecyparis nootkatensis 'Sparkling Arrow' grows identical to 'Green Arrow', and in fact originated as a mutation on a 'Green Arrow'. 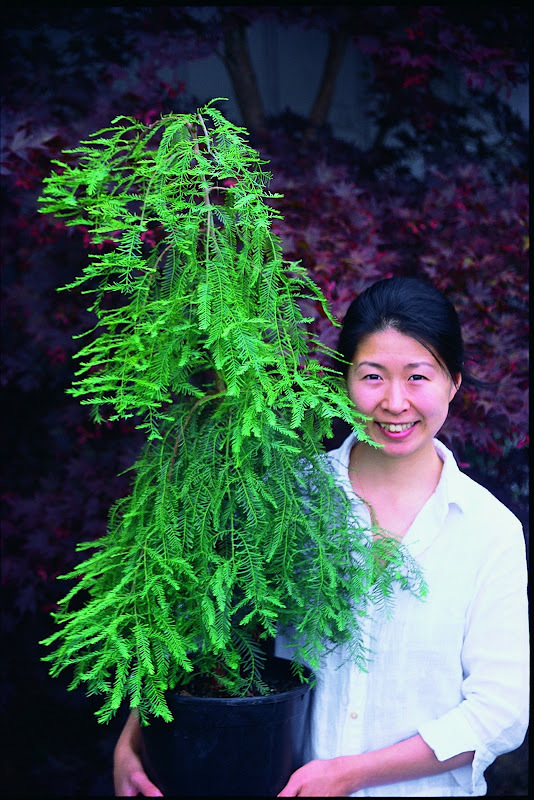 A Tasmanian cypress, Dacrydium cupressinum, is not hardy outside for me, so I used to grow it in a greenhouse...until it hit the roof. The photo above was taken at the Strybing Arboretum in San Francisco, where the tree grew beautifully. 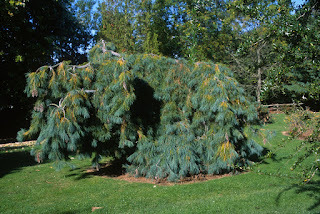 I have search for it on my past two visits, but it seems to have disappeared. My directional skills were never very good, so maybe that was the problem. 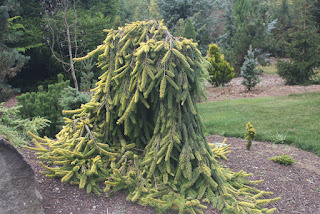 Or maybe there was a freeze that did it in. 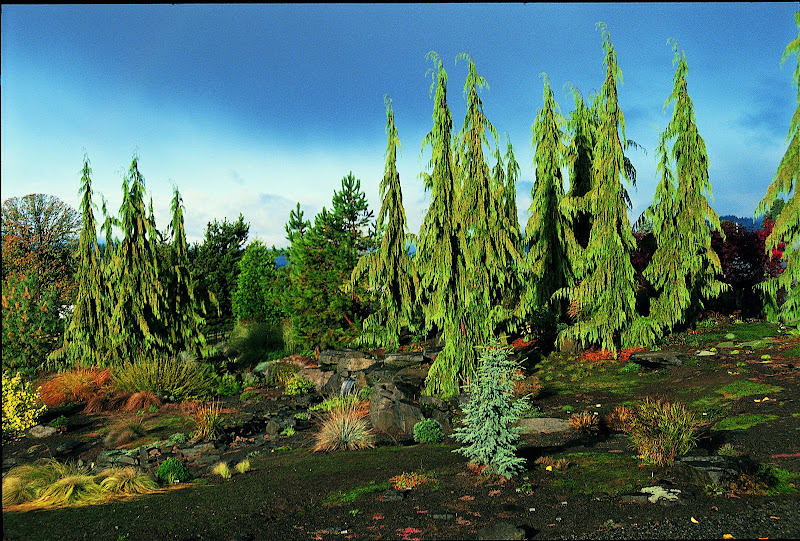 Simply asking at the Arboretum can become a bureaucratic nightmare, probably with dozens of forms to fill out and fees to pay. 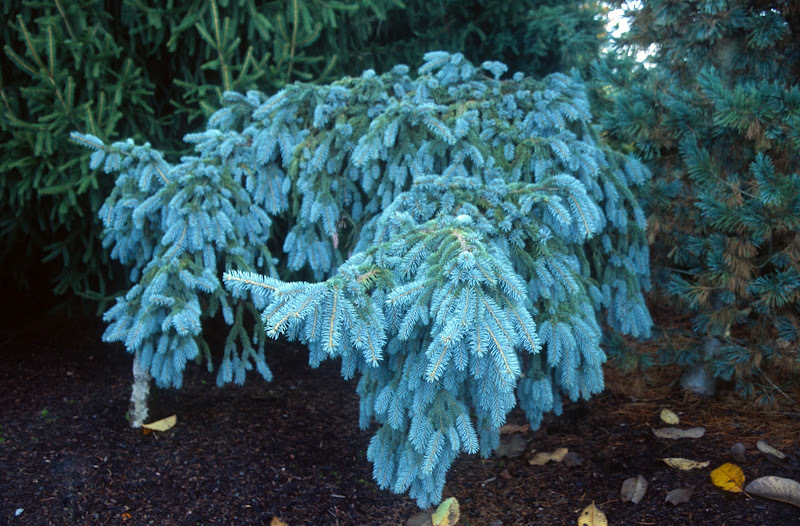 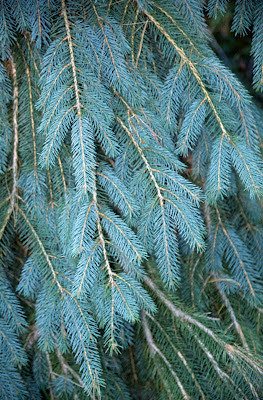 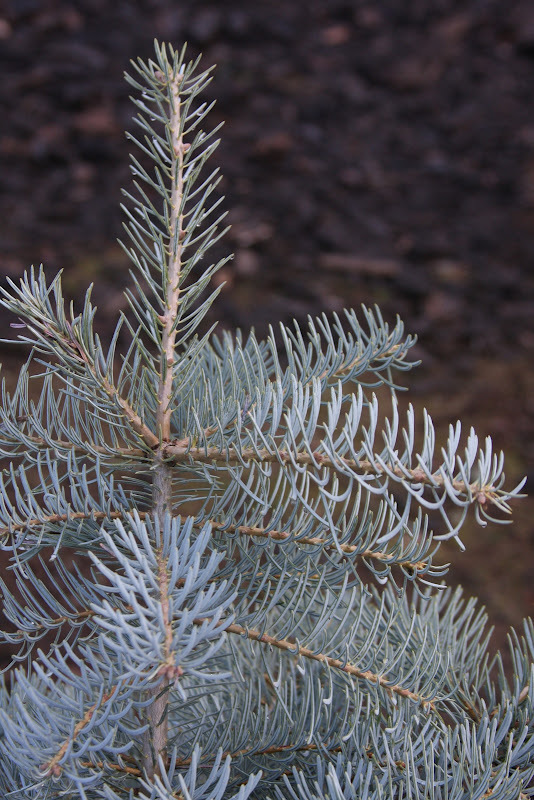 Abies concolor 'Blue Cloak' is a semi-pendulous form of the "white fir." It has a soft, graceful appearance that is loved by all. 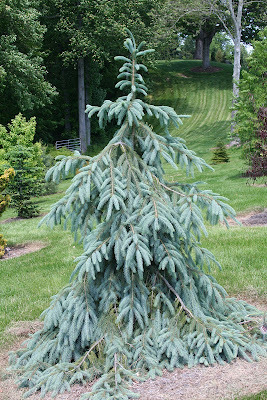 But strangely, my largest specimen, as seen in the photo above, does not droop anymore. 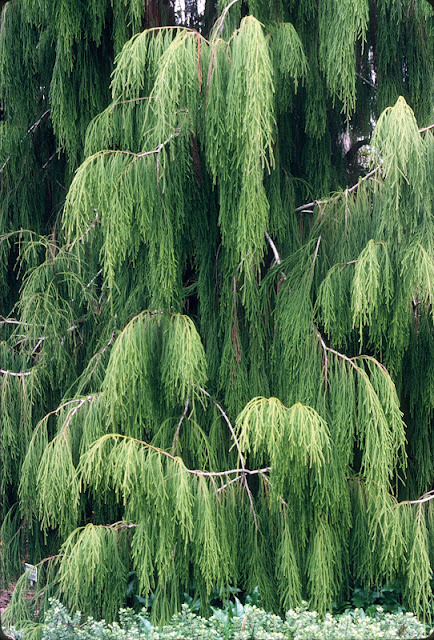 We hacked on it for many years for scionwood, so maybe it has retaliated by refusing to "weep." 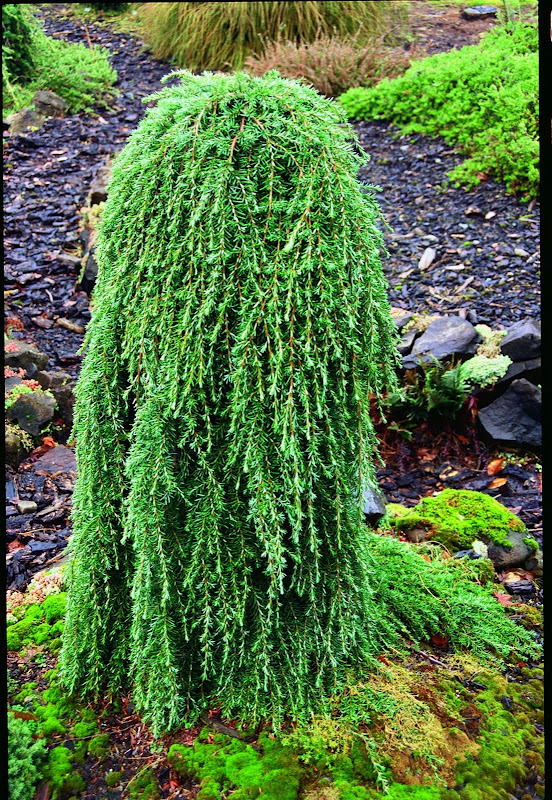 It is rejecting its pimp-for-profit owner perhaps. Another fir, less put out, is Abies nordmanniana 'Pendula'. 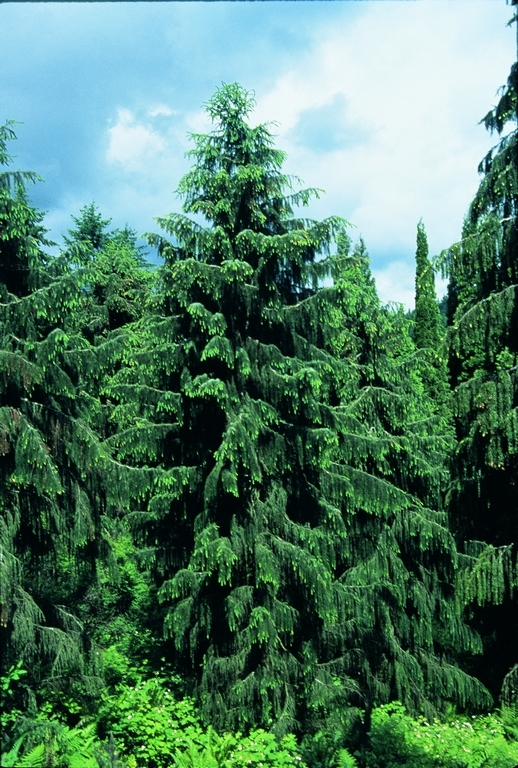 It is one of the old European selections that has mostly fallen out of favor. Retail nurseries don't order it anyway. 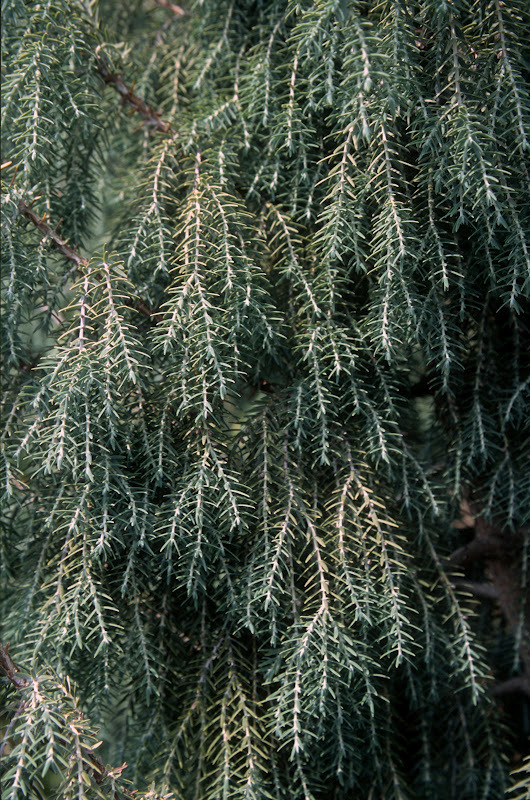 I don't really care because I like Abies procera 'La Graciosa' better. 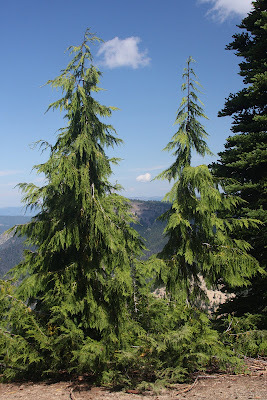 This is an Oregon introduction that can have two different shapes: one can be low and spreading, with no inclination to develop a leader, and the other an aggressive skyrocket that seeks the highest atmosphere while staying skinny all the while. 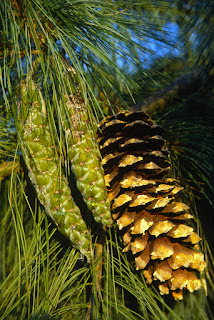 Strangely, my oldest specimen of the narrow form has never produced the famous procera cones.